Since December is the biggest giving month of the year, let’s discuss being a Giver this week, using that word as an acronym. The G in Giver stands for Generous. The spirit of generosity is sometimes lacking in our selfish world, but not in my friend, Rick. Rick and I have had dozens of meals together, but rarely do I get the chance to buy. He receives great joy in exercising his gift of generosity so he proactively arranges to get the check. 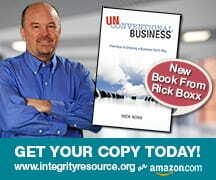 Over the years Rick has inspired me to look for opportunities to be more generous. Picking up the tab at workplace meetings is an easy way to exercise being more generous.